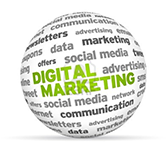 Digital marketing can be apply on products and services with various digital technologies like the internet, including mobile phones and other digital platforms medium come under digital marketing. This tutorial describes about how to use several social media platforms such as Facebook, Twitter, LinkedIn, and Google+ to grow your business and create greater awareness about the products and services you offer. This tutorial is mainly designed to assist the readers across marketing and advertising, with interest in of a career in Digital Marketing. To learn this tutorial, one should basic understanding of the fundamental concepts of marketing and advertising.